Pipe Nuts G 1/8 " to G 1½"
Castle Nuts 1/4" to 1"
We manufacture special fasteners that are tailor-made to meet customer specifications. Our extensive special products range consists of high tensile bolts, screws, nuts, studs and so on ranging from 4mm to 40mm. 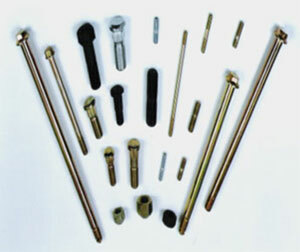 Wheel/Hub Bolts, Wheel Studs/Nuts, Two-Piece Wheel Nuts, Track Shoe Bolts/ Nuts, Flange Bolts, Axle Bolts, Connecting Rod Bolts/Nuts, Durlock Bolts, Main Bearing Cap Bolts, Cylinder Head Stud/Bolts/Screws, Tappat Screw, Counter Weight Bolts, Fly Wheel Bolts, Banjo Bolts, Center Bolts, Spare Wheel Carrier Mounting Bolts/ Nuts, Double End Studs and so on. We are Capable of providing customizable solutions to requirements by making sure that all the technicalities are met by adhering to engineering standards. We at MPS understand that technological innovations, use of imported machines and measuring instruments along with systematic application of manufacturing processes are a few requisites for the fast and precise development of special products. For further information on our extensive Products Range such as dowel pins, socket head screws, please contact Micron Precision Screws. � 2005 MPS Limited. All rights reserved.